At this point Christmas is three days away, you may be one of the lucky few who has everything perfectly wrapped under the tree, sipping hot chocolate and enjoying the festive holiday music or……you may be one of the few who “has just a few more things”. Here’s a list of some quick and easy last minute gift ideas. Rope Wreaths: If you’re like me and have a pile of old ropes cluttering up your tack room or trailer, this is the perfect use for them. You can add a unique letter from Hobby Lobby to personalize it or just hang a horseshoe from the center. Top it with a bow and you’re ready to rock. These make a great gift for your horse trainer. Rope Lamp or Vase: I’m all for de-cluttering the tack room, so in keeping with the rope theme grab your glue guns and a dollar store vase or a lamp from your local second hand store and decorate those puppies! Rope vases make a great hostess gift and the lamps might cheer up that mother-in-law! 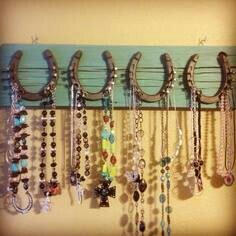 Horseshoe Jewelry Hanger: Grab a blank wood piece from Hobby Lobby or Home Depot. Spray paint it. Grab some horseshoes from the bucket you have and nail them on the board. These make a great gift for your horse crazy nieces or trail riding partner. Hand-lettered Sign: Have a cricket or other vinyl cutter? Paint a wood plank, apply the letters and seal it with Mod Podge. Feeling ambitious? You can find hand painting tips on Pinterest. I would love to see your last minute gift ideas, find me on social media.